The fun 10-minute fabric bracelets created by Women Who Do It All were the most viewed post last week. Go HERE to make some for yourself! Super cute! Our sponsor for the week is Flirty Aprons. 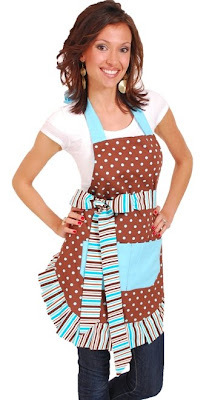 They are giving away one beautiful apron to one of my readers. Go HERE to enter the giveaway. Blog Tip For The Week! HOW TO: Receive Comment E-mail Notification AND How to change the wording at the top of your comment box. I just completed these in less than a minute! DO IT!!! Go HERE. I want to reinforce the tip at the bottom of this weeks How To: TURN YOUR WORD VERIFICATION OFF. I have probably only received 4 spam comments in over a year of blogging and I just erase them! You will receive more comments if you don't have word verification! I am SO EXCITED for this week's Categorically Crafting show on Friday. The theme is MIRRORS. How do you "view" yourself? It's not too late to make something. The link will be open all week. Come back on Friday to see everyone's creativity. Thanks for hosting. I agree with turning the word verification off. It is sometimes hard to remember to go back and make sure your comment has been posted. I am sure I have left comments that have never been received because I forgot to type in this extra step. I still leave comments, but it's a pain when you're leaving as many comments as you can on several different blogs in a row, and they all have word verification on them. Also, the noreplyblogger thing. About 75% of the people who leave comments for me have this and I just don't have the time to go track down everyone's e-mail addresses, so I just don't respond. I think I may do a post on that and how to change it. It makes me sad that these sweet ladies have commented on my blog and don't get a response. BTW, I noticed above the bracelet picture there's some raw html code showing. I checked in Firefox too, just in case and it's there too. I can't get your html code for your button :( I don't know if its my dumb work computer or what but its IE. I couldn't agree more with what a nuisance word verification is! I love to comment, but the more steps it takes, the more frustrated I become! Woo hoo Michelle! Another great party. Thank you for hosting. I totally agree with you that word verification should be banned. i always love a good blog tip! thanks so much for hosting the party! Just discovered your blog today, and I love the concept. I've got a PILE of ideas in the "someday" category. Right now, the current procrastinator is that my craft room is being redone. Thanks to your blog, I'm sure I'll be adding to the pile! Thanks for hosting a great party! now i need to go check out the denim flower posted right before my lace flower...way to cute! Wow, I can't wait to check out all the links this week. I agree about the word verification. I think I've commented on blogs but it was never posted because I've clicked away too soon. Now I'm going to check out some of these awesome links. Couldn't say it better myself that word verification thing drives me nuts! I've never received any spam for a year now. Take it off people! Thanks so much for hosting each week! LOVE this party!! Hi, I'm back to look at more links. I turned off my word verification a couple of weeks ago. Thanks for hosting, Love your Posts! I am just curious - how do you know that you will get more comments without the word verification? Up until now I thought that the word verification really isn't something hard to do (never has made me not leave a comment). I'm so excited to be the top viewed project :) Thanks for the shout out! Thanks for the comments on my blog :-) and for answering my question above! But maybe it'll get better ... still wanna see whether I'll get more (regular - not spam) comments. The biggest problem with word verification is if you have it show up AFTER someone hits post comment. People hit post comment and then navigate away from the page because the page will reload and sometimes takes a second to pop down to the verification process. I know there have been times when that happened but I had already started to navigate away from the page so didn't bother to go back... and I have been told by others that they don't take the time to leave a comment if they are in a hurry and it has word verification set-up.... ;) I would love to hear from you ladies on your experiences after turning it off.